Have you ever had a die touch your heart and you just know that there isn't much that needs to be done to a card because the die speaks for itself? 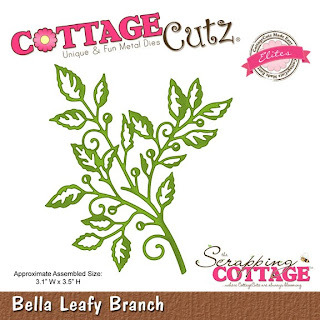 That is what the Bella Spring Tree die is all about. It's feminine swirling branches are just lovely against this green and white gingham paper. 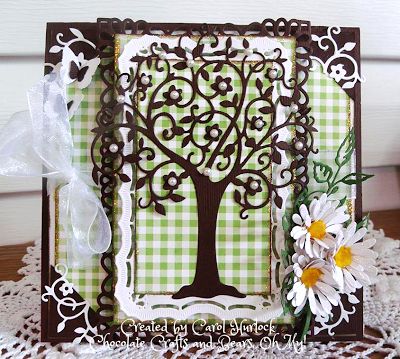 The Bella Spring Tree was cut on dark brown cardstock and white cardstock. Little pearls were added to the flowers on the brown tree and it was attached to Resplendent Rectangles. The corners are 1-1/8" brown squares that were cut in half and decorated with pieces cut from the white cardstock tree to fit inside the triangle. 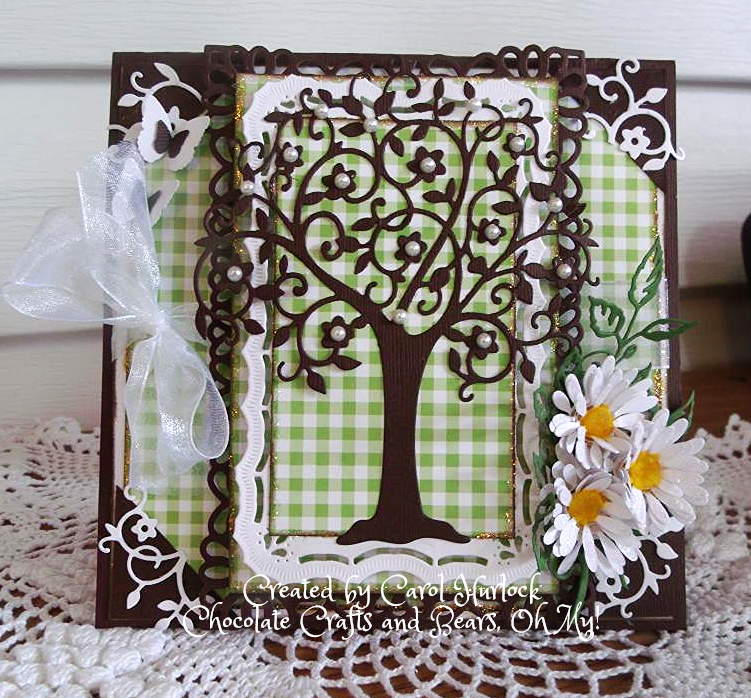 It carries the theme of the tree to the edges of the card so perfectly and adds another element of femininity. Your tree is stunning, Carol!! Gorgeous card! What a beautiful tree, Carol, and the Gerber Daisies are so pretty. It all looks great on that green and white gingham. Hope you have a fabulous Sunday. This is just gorgeous! I've been eyeing this dye for awhile & telling myself I didn't need another one, but oh, you have made it irresistible! Your daisies are awesome too! So pretty! 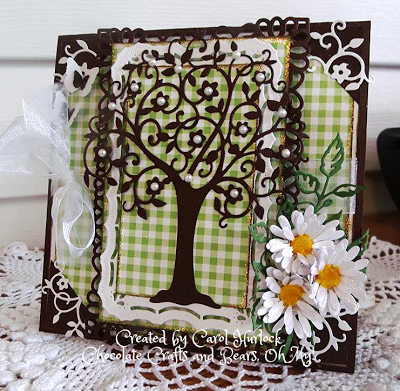 I'm a big gingham fan, and your gingham looks so perfect for a background on this card! Another die on my wish list! That is one beautiful die. You can say what you want but I still think there are about 41,000 details on this wonderful card. Perfect flowers, colors, and layers as usual. Very pretty and very sweet. Hugz!!!! gorgeous, love all the details! Chocolate, Bears and Crafts OH MY! is RIGHT! WOW! This is gorgeous, Miss Carol! I love love love the way the gingham panels are separated by the tree panel! Wonderfully "homey" warm coloring, Carol. Like safe, smell of bread, pretty trees in the yard, apple orchard homey. So pretty, I am pinning it to remember the layering idea. Love the daisies and white bow. The ribbon feels like a sheer white curtain billowing in the breeze. I love all the details you place in your cards, Carol. This one with the pretty white vines, and butterflies, is so pretty! This card is just gorgeous!! Love the colors and all the pretty details! Love your work!! 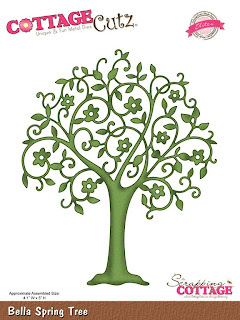 I agree with you, this beautiful tree doesn't need much adornment. Wouldn't it look cute with little red punched apples? Wowzers.... gorgeousness all over this card! The tree is stunning by itself but all the other details you added from the pearls to the layers and corner vines all to the beauty!